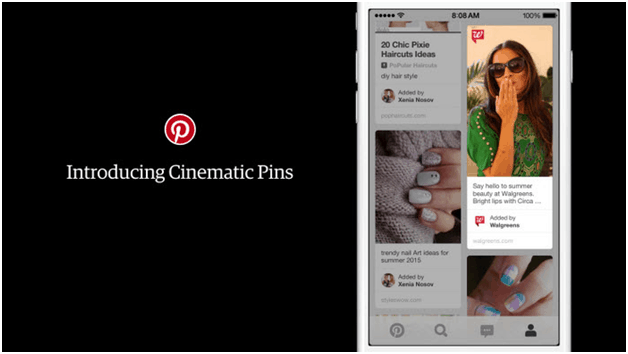 Pinterest is now moving towards animated ads with the introduction of first motion based promoted pins. With the introduction to this new feature, the brands available on Pinterest are all set to target their audience with the video ads. The new animated ads are known as Cinematic Pins and are somewhat little bit changed from the moving ads of rivals like Facebook and Twitter. On the later platforms, video starts when user stopsscrolling over them and stop when the user scrolls away. Pinterest has just the reversefunctioning. The Cinematic Pins startswhen the user scrolls, but the motion stops when the scrolling stops. Pinterest did not have any interest in auto-playing video ads”, saidKendall, General Manager of monetization. In a study last month, around 90% of Pinterest users have finalized their purchase by the prompted pins on the screen and with the introduction to this new advertisement technique, the platform willwitness a shoot in purchase. In the initial stage, the feature will be available for the mobile app only.Advertisers will be able to buy promoted app pins, which will allow the user to install an app directly from a pin. “What we’re announcing is a whole new set of options around promoted pins which we believe will provide a solution for businesses of any size to meet any marketing objective,” said Tim Kendall, who oversees product, marketing and sales for ad and partner products, in an interview. The full-motion ad takes over the screen and moves if the user taps on the Promoted Pin. Example can be visualized in the link below. Pinterest has also plans to introduce new ad pricing options. The site is adding a cost-per-engagement (CPE) model for promoted pins, which will charge marketers solely for the ads users engage with. For example, for promoted app pins, the marketer will pay solely when the user actually installs the featured app. Pinterest will still offer cost-per-click (CPC) and cost-per-thousand (CPM) models. According to a market research company, e-marketer, “advertisers will spend $23.7 billion this year on social networks globally, up 33.5% from last year.